I've run with a lot of people over the past 5 years. Robyn was there with me for every step of the Boston Marathon and lots of the training runs. Monica has been a steady running partner for road and trail runs as we explore new areas and revisit old friends. Alyssa, Elizabeth, Reji, and lots of the others in TARC have introduced me to regular training runs in the Fells. Even from afar my brother has challenged me to run further and faster. But my first and best training partner has always been Chuck. When I first started running I was working in Kendall Square. At lunch I'd head out and meet Chuck partway through the run. We'd enjoy the sun, the mid-day crowds, the running paths and then go our separate ways. We fell into an easy rhythm early on. Later, we planned runs together and they became my first 5 miler, 10 miler, 15 miler. One of the most important runs we did together was 18 miles long and it was the one that convinced me that the marathon was possible. Until then I'd had trouble with leg cramps on my long runs, but Chuck's familiar companionship, steady pace, and comforting manner made that run possible. Later I raced with Chuck in a summer 5K series, working on speed and enjoying the post race beer. If you haven't guessed, Chuck is the Charles River. I've run along the Esplanade, around Harvard Square, from Community Rowing, out to Newton, and across the many bridges along the way. The bike path runs up and down either side of the river, all the way from the Museum of Science out to Newton. 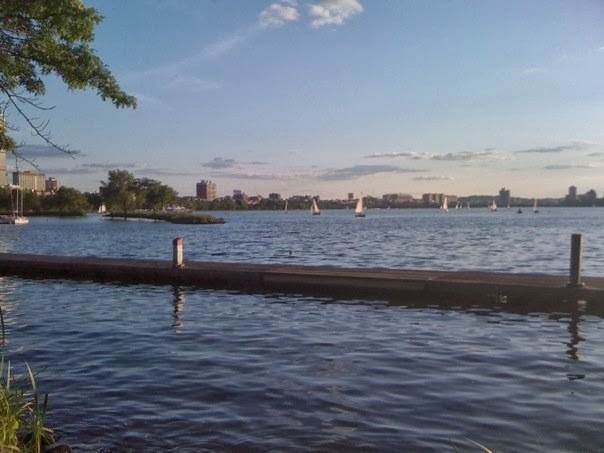 It ranges from vibrant and active sections by MIT and the Esplanade, straight and steady sections by the BU bridge where you hit your groove, isolated and quite paths in Watertown where you can sometimes run a mile without seeing another runner. It's got variety and familiarity, activity and solitude, running partners galore, people watching, crew boats and bikes to race with; pretty much everything to ensure you'll never get bored or complacent. Finishing my first 10 mile run just past the BU bridge, the feeling of elation at reaching an ambitious goal and making me feel like anything was possible. Post snowstorm night time run though deep drifts by the Anderson footbridge wearing every light I owned. My first 5K race, standing in a huge crowd on Greenough Blvd trying to guess my pace. 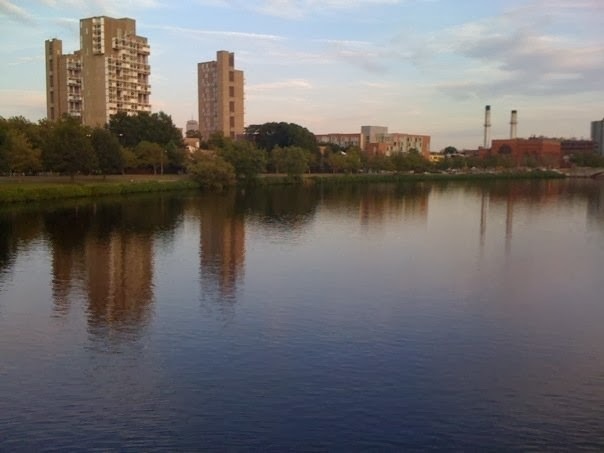 Cruising along the Cambridge side near MIT with Monica, looking at each other, and simultaneously saying "How about two extra bridges?" days I'll drive straight to the river, pick a spot, put on the headphones, and think "How many bridges today?"